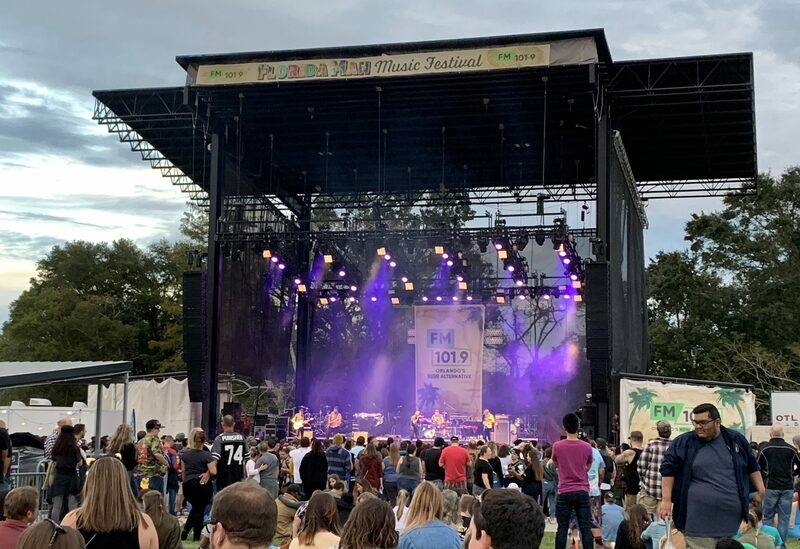 ORLANDO—The Florida Man music festival, sponsored by FM 101.9, took place at the Central Florida Fairgrounds on Nov. 30. Anticipation had been high since first hearing about the festival, and after following Sweet Cambodia’s epic journey, the excitement for the festival itself seemed to grow exponentially. Walking through the dusty parking lot, I saw the end of the line. “Val Hallah,” I thought as I finally saw the beginning of the end of my journey. The line to check tickets was cluttered with bodies, all strewn with patches, hats, tees, and other garb that may represent who they’d come to see. We all shuffled slowly through the dust and hay that covered the lot like a filthy, green shag carpet. Finally crossing through the security barricade, they spun everyone around in frantic circles, only to throw you right back into the mess; but like that, we were in, and the show was ready to begin. Sweet Cambodia was the first to take the stage, since the band had won its shot to open for 15 other groups (Superorganism, Two Feet, The Driver Era, Lovelytheband, Dreamers, Bob Moses, Rainbow Kitten Surprise, Alice Merton, Sir Sly, Robert Delong, Bishop Briggs, Iration, Cold War Kids, Young the Giant, and the festival headliner: Weezer). The members of Sweet Cambodia took the opening slot on Stage B, which was the smaller of the two. Their performance was highly anticipated by many long-term fans, as well as those who’d recently gained knowledge of them due to their victory at the contest. As they set up for their 2 p.m. start, the crowd slowly began to mosey its way over, and, by the time, they started, the whole field in front of them was filled. Their set was heavier than an 18-wheeler packed with dynamite, and once they lit up, they gave the festival an explosive start. They began by laying on the floor, waiting for the beat of the drums to resuscitate them like an electric jolt, eventually bouncing their way upright to stand in front of the crowd. Playing some classics off of their EP “Tasty” along with a few songs that are scheduled to be released early next year. “Everyone’s set is so short, it’s just going to be bangers from everyone. So, we’re trying to do the same” said Eric Charles, as I wished he and the rest of the band a stint of good luck, before they had taken the stage. As their set came to a close, they thanked everyone, and Stage B grew quiet. Then the mass crowd noticed a faint sound across the lot, as Stage A was growing louder with the sound of Superorganism began playing with their self-titled song. The electro-modern-pop group came out wearing what looked like bedazzled costumes for a children’s medieval puppet, but they rocked the look. The group is made up of seven people, three of which play instruments and the rest dance and add in background vocals. With a mainly synthesizer-based sound, they electrified the crowd with their supreme weirdness, and in a strange way, it was awesome. I didn’t see many people running for their T-shirts after, but it was obvious the crowd enjoyed them. As they finished off, I realized what the next few hours were really going to feel like. The running back and forth between Stage A, and Stage B, would soon feel like an epic ping-pong tournament, with a foul every time you had to go ‘out of bounds’ to use the restroom or get some food. Otherwise, each audience member became the perfect volley in a game they’d themselves created, by showing up to the festival. The next few hours flew by with so many bands, all playing about 30-minute sets. Two Feet followed Sweet Cambodia on Stage B, and everyone fled from the end of Superorganism to see the next act. The crowd roared and chanted and after a long set of highly sexual lyrics, ear busting bass and smooth electric guitar licks, the alternative/indie artist slowed down and concluded. And then, *smack* the ping pong ball of people bounced back on over to Stage A to see The Driver Era, and *smack* back to Stage B for Lovelytheband. The volley was precise and was not going away any time soon, and these people were hungry for music. It felt nearly unsafe to walk around with a beverage without a lid, or food that was still hot, because if you weren’t careful, the avid mall-store shoppers, and alternative-rock listeners would trample anyone, just to see who was coming on next. It was Bob Moses and his set was simple and smooth. Not a lot of production or over selling; just a man, a band, and his instruments. Bob Moses played music off his 2018 album, “Battle lines” along with music released prior, such as “Tearing me up” released 2015. Sir Sly started on Stage A, just as the sun was fading behind the stage. His set followed the sky and went from light to dark. Soon relying only on-stage lights, the natural light slipped down under the dark sheet of night. Unless you’re familiar with Sir Sly’s music, you might access him as your casual one-hit pop star. His set solidified a contrary belief for many of the audience members, including myself. Many people seemed to be holding spots on Stage B for Alice Merton, but their attention was pulled towards Stage A, and the crowd quickly grew. Then once subsiding, the crowd fled back towards Stage B to see Alice Merton finally take stage, and the night only sped up from there. Bishop Briggs, a British pop-singer, took Stage A and gave her performance more energy than you’d expect from the Energizer bunny. She spun and jumped and screamed and never stopped moving from beginning to end. Her pure stoke for being there and playing for the crowd was unmatched, and her enthusiasm transcended into the audience. Many of those who weren’t familiar with her work even began to move and rock to her music. Iration was the second to last band to take Stage B. Coming from Santa Barbara, California, all member originally moved to the United States from Hawaii. They are known for the cultivation of the reggae subgenre Sunshine Reggae, and their sound matches that description perfectly. With a very positive vibe to their songs, the music bounced gently like a beach-ball through the hands of their fans. The bass was heavy and so were everyone’s feet after the long day of walking, and their set was exactly what everyone needed, right when they needed it most. As the night pushed forward, the remaining bands were able to save their energy for their performance. Cold War Kids took the stage and played music from their newest album, as well as a classic all their fans were looking forward to, “Hang Me Up to Dry.” This throwback showed how much their sound has changed since its release in 2006, but they still enjoyed performing the song, 12 years later, and everyone sure enjoyed hearing it. Young the Giant took stage as the last band to play Stage B and they played songs new and old. They are an alternative pop group from Irvine, California, that formed in 2004. Their sound has matured and molded since then, and their set captured that Golden State feel that their music provides. There’s a warm sort of feeling that emerges from inside as the sun sets on the west coast, and they preserved that feeling in song to share with their fans. They closed out Stage B and were the last band to play before the Florida Man festival headliner, Weezer, took the stage. 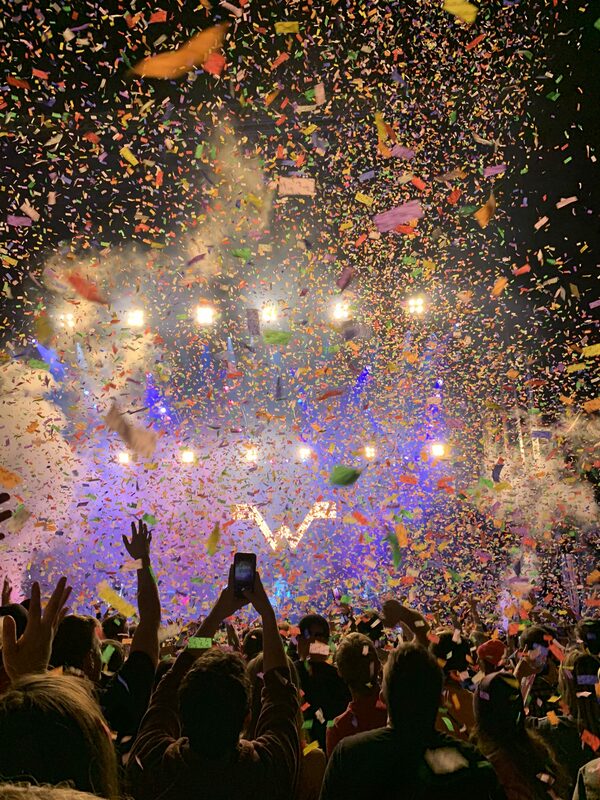 Weezer has been around since 1992, and most of the people at that festival were obviously there for them. There was an excessive amount of Weezer merchandise that dated from 1992 until present. From hand-made patches and scarves, to expensive hats and limited-edition jackets, Weezer fans have been dedicated since day 1. Weezer opened with their classic “Beverly Hills”, which is the song that drew me, and many others to become a fan as, I heard it nearly two decades ago in my dad’s car for the first time. Many parents brought their kids to see Weezer, just as they had seen them when they were the same age their children are now. After playing classics like “Pork and Beans,” “Buddy Holly,”“El Scorcho” and their new cover of Toto’s “Africa,” lead singer Rivers Cuomo rode out on an electric scooter into the middle of the crowd to sing their hit “Island in the Sun.” He began strumming, and the guitar was noticeably quiet. The (what was supposed to be) acoustic cover of the song quickly changed to an A Capella version in which almost every member of the crowd helped him fill in. (I had seen Weezer a few months back and watched Rivers pull the same stunt off correctly, but this was pure magic.) The entire stadium filled with thousands of tired, sweaty humans all joined in, and the song turned out much better than anyone, even Rivers, could have probably imagined. Their set continued as they cranked out crowd favorites, and they finished off their set. Everyone was sitting in serious disappointment, no one wanted their set to end. There are always a few people to slide out a little early to beat the traffic at concerts; but not for Weezer. Not a single person moved as they walked off the stage and turned down the lights. Quickly chants started and groups of people all started yelling “Encore” and “One more song”. Within seconds, the band all ran back out and Rivers pleased the crowd with “Uno Mas.” They started right into “Say it Ain’t So” (another Weezer classic they didn’t play the first time on stage). But the crowd still wanted more. They looked around at each other and went right into a cover of “Paranoid” by Black Sabbath and the crowd freaked. Jumping and jiving with excitement, but everyone knew, this was really the end. They finished, blasted confetti on everyone, took a bow and that was that. It was truly a great day for the Orlando music scene, and they kicked everyone right in the head at the end. They showed everyone how a band was supposed to perform, even 25 years after their conception, they still play like they’re just a few teenage friends, jamming in their parent’s garage. The Florida Man music festival was a success. This was the inauguration of what could be a yearly event for the Orlando Music scene, and with such a frenetic beginning, we can only hope that it stays around for years to come. Not only was the festival affordable ($40 for 16 bands) but they packed the list of artists airtight with only the best of today’s alternative rock, along with a rocking headliner. With no complaints from anyone and FM 101.9 being aware how great and smooth their festival went, there really may be another Florida Man on the horizon. Even the paramedics said it was one of the best-behaved festival crowds they’d ever had to watch.